A man has been jailed for seven years for a spate of distraction burglaries on elderly women, including a 101-year-old from Thame. David Kerrigan, also known as David Brown, 36, from Wellow Road, Ollerton, Nottinghamshire, was jailed at Harrow Crown Court for seven years after pleading guilty at an earlier hearing to seven offences across Hertfordshire, Bedfordshire and the Thames Valley. All of the offences happened between June and July this year (2016). In each case, Kerrigan targeted elderly female victims including women aged 86 and 84 in Aylesbury and a 101-year-old woman from Thame. Other cases took place at a sheltered housing complex in Tring and at the home of a 90-year-old woman in Luton. 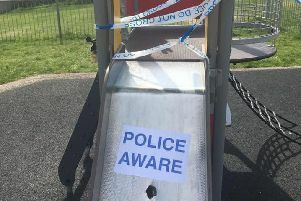 Police released a description of the Tring incidents which took place at a sheltered housing complex. Kerrigan entered the building and knocked at two flats, stating he was carrying out security checks following a spate of robberies and thefts. He asked the victims, aged 89 and 75, where their valuables were so he could check them, before making off with jewellery and cash. In one of the other Tring incidents, Kerrigan knocked at the home of a 77-year old woman and stated that her neighbour had problems with their water and that he needed to come in and check the valves on the radiators. He made the victim clear out the cupboards under the sink and turn on the taps while he walked around the property. The victim then became suspicious and called out to Kerrigan, who was upstairs. He then left and the victim found her bedroom had been searched and a ring had been stolen. In the Luton incident, the victim, aged 90, woke to find Kerrigan in her bedroom. After he left, she found her flat had been ransacked and cash and jewellery had been taken. The burglary series was investigated by Hertfordshire Constabulary’s Operation Manhunt unit and a search for Kerrigan was launched. An appeal to trace him was also featured on the BBC’s Crimewatch programme in September. He was later arrested in Nottingham on September 21. Detective Constable Sam Casey from Operation Manhunt said: “David Kerrigan preyed on elderly, vulnerable women in their own homes and his despicable actions have had a devastating effect on his victims and their families. “Sadly, one of his victims has since passed away and was never able to recover from her ordeal. “I hope today’s sentence can at least provide some small comfort to everyone who has been affected by Kerrigan’s callous behaviour.